Fellini's frequent obsession, the circus, is the centerpiece for this devastating leap from neo-realism to the realms of fantasy and obsession. Anthony Quinn stars as Zampanò, a brutish strongman, and the plot centers around his uneasy relationship with his assistant and a clown, played by Giulietta Masina and Richard Baseheart respectively. 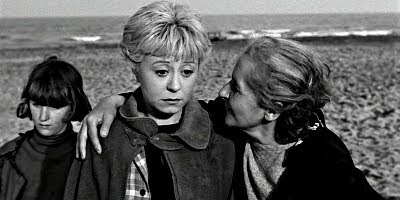 Whilst sharing the same post-war Italy as the likes of The Bicycle Thieves and Umberto D, Fellini eschews the flat, naturalistic feel of De Sica and others and invokes a real sense of almost operatic tragedy and despair. Fellini's later films are, perhaps, more typical of his oeuvre, but his status as an auteur was cemented here. Quinn and Masina give superb performances here, and Baseheart gives ample evidence that his later career in Knight Rider, Hawaii 5-0 and Columbo was entirely undeserved.